Getting into embroidery with little to no experience is challenging – as much as we want to hand-craft handkerchiefs, table-cloths, bedsheets and dresses for ourselves and our loved ones, one doesn’t start off with complex designs and intricate needlework after just a couple of lessons. It takes a lot of time, effort and dedication to get to the point where we can confidently say our needlework is good enough to put on display – unless, of course, you’ve picked the right machine to make the job that much easier. Take a look at our picks for the devices likely to make your life as an embroidery noob all the simpler. We are not exaggerating when we say this machine does practically all the work for you. Whether you’re prepping a handmade gift with the recipient’s name stitched in, want to put together a charming set of DIY napkins for Thanksgiving dinner, or are customizing your own clothes, you can easily skip all the embroidery lessons with this device. 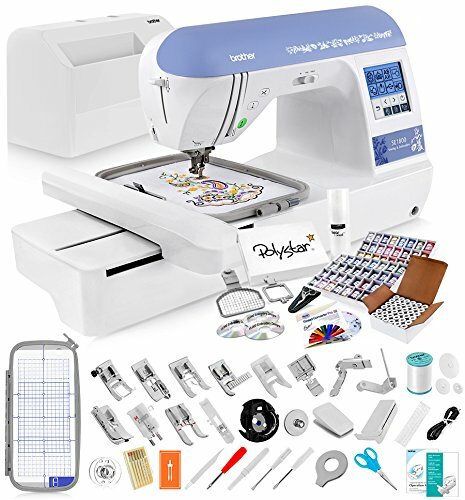 A dual sewing-and-embroidery machine, this smart device comes with a mindboggling 200 in-built design patterns for embroidery, either preset into the device or available in the included USB stick you can insert into the machine. A touch-screen control panel lets you select one of numerous patterns viewable on your computer as PDF files to give you a better idea of thread count and color, also letting you fiddle with settings such as rotating, mirroring, enlarging or shrinking your chosen design. It is a simple matter of removing the embroidery unit and changing the press foot to use this as a sewing machine instead, with 250 stitch patterns available for you to choose from. The machine comes with drawers and storage units you can pop bits and pieces and other compact tools into for easy access as well. Threading your needle is a breeze, a simple matter of inserting your thread of choice under the lid of the machine and then winding it through a simple set of steps to where the threader automatically pops it through the needle’s eye. After that, it’s only a matter of sliding one out of two available hoop sizes with your fabric of choice into place and hitting the start button to let the embroidery arm work its magic, the smart display notifying you every time you need to cut off the thread tail or switch thread colors. This lets you monitor and approve of each step of the process. While the machine may seem complicated and overwhelming to operate with its various parts, it is anything but – designed to maximize convenience, every component is fuss free and simple to assemble, with a list of easy to follow YouTube video tutorials included to get you going. If you are looking for something exclusively for embroidery, or already have a fully functional sewing machine you are satisfied with, this embroidery-only version of our Star Pick might be the right fit for you. 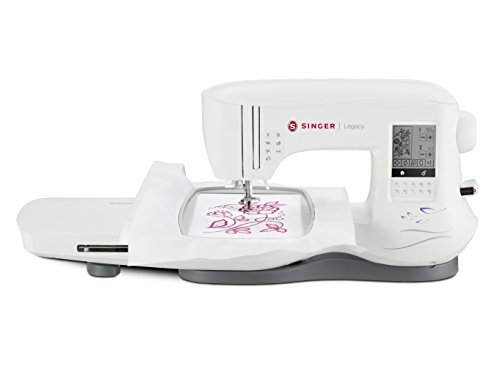 Packed to the brim with the same cutting-edge technology of the Singer SE300, you get a more compact device with a detachable embroidery unit, bearing the embroidery arm which basically takes care of all the hard work. With two available hoop sizes, a pack of embroidery needles and bobbins similar to the SE300 model, the device also comes with a USB stick with over a hundred stitch and embroidery designs you can input into your machine, or view as PDF files on your computer or laptop with additional details such as true size, thread color and order. Including the preset designs, the EM200 has a total of 200 embroidery designs and six intricate font options that you can switch between and edit using the smart touch-screen display, with simple to assemble and disassemble parts and a handy series of video tutorials to guide you through the process. Create expert-level embroidery for your clothes, quilts, baby bibs and more with this computerized sewing-and-embroidery machine, programmed with 136 embroidery designs and 6 decorative fonts you get to choose from, while your machine does the rest. 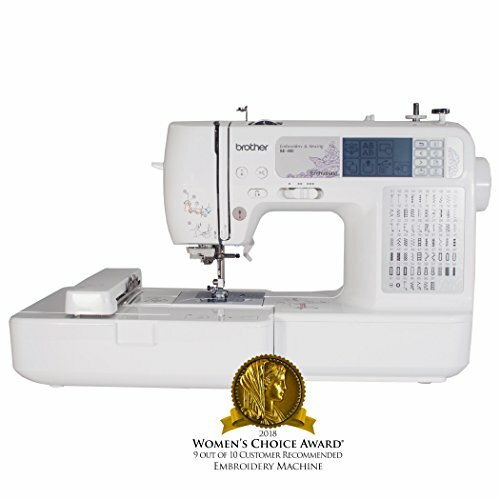 The digital display panel and comprehensive controls make selecting and editing any of the available patterns – or the hundreds of patterns you can import via the USB connection port from iBroidery.com, to which Brother users get exclusive access – as easy as it can get. Options include easy-to-grasp controls for rotating, mirroring, shrinking or enlarging designs to customize the outcome as you prefer. The device comes with two hoops – a 5 x 7 option and a multi-positionable 5 x 12 hoop – as well as automatic thread cut-off and pre-wound bobbins that make the task of getting started smooth sailing for beginners and skilled embroiderers alike. This computerized machine makes professional-grade embroidery possible for any novice – equipped with 70 embroidery designs, 67 stitch designs (displayed for your reference along the side of the machine) and five decorative font styles, it’s a simple matter of pressing the right buttons as you select and edit an embroidery pattern and let the Brother SE400 do the rest. With a memory card slot and USB port, you also get to import new designs into your machine, especially via downloading unique, themed and licensed designs from iBroidery.com, available exclusively for Brother users. The USB cable connection can also be used to download updates for your machine, which comes with a handy LCD display built-in with visual guides and tutorials to help you through operating the machine. 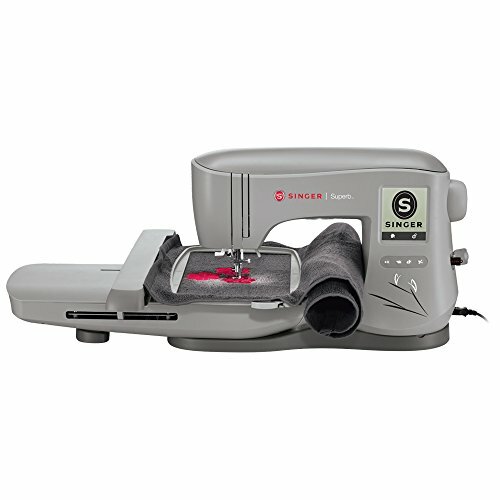 Other handy features include the automatic thread cutter and speed-adjustment options – you can sew at a speed compatible to your skill level, as well as reverse-sew without having to turn your fabric around. A couple of features make the best embroidery machines stand out from the spread, especially for beginners. Smart embroidery machines come with in-built mechanisms such as automatic threaders, pre-wound bobbins, and in-built stitch and embroidery patterns that let you set up your device with minimal effort and fuss, without the need for prior experience or hours and hours of practice. Look out for machines that come with a versatile selection of embroidery designs included or pre-built into the device, as well as those that let you upload designs from external sources to give you greater diversity and room to let your creativity run free. Different sizes of embroidery hoops and easy-to-comprehend editing options also let you customize the designs to your preference.